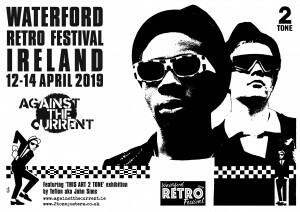 Against The Current Retro Festival 12th to 14th April in Waterford, Ireland with a Ska All Dayer Sunday 12th. Looking forward to meeting new friends in Ireland. 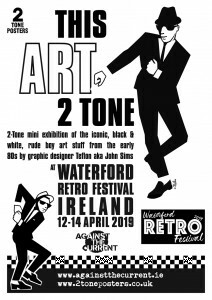 A 2 Tone Posters exhibition at Against the Current Retro Festival, Waterford, Ireland features from 12th to 14th April. 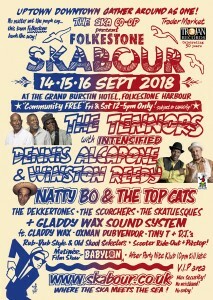 FOLKESTONE SKABOUR FESTIVAL Sept 14, 15 & 16 of 2018 is looking to be one of our best festivals yet. The main venue is the Grand Burstin Hotel at Folkestone Harbour. 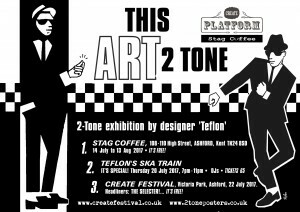 The voluntary Ska Co-op present a great line that includes headliners: THE TENNORS with backing band INTENSIFIED, DENNIS ALCAPONE & WINSTON REEDY, NATTY BO & THE TOP CATS. + The Dekkertones, The Scorchers, The Statuesques from Dublin. + DJs Gladdy Wax, Oxman Dubvendor, Tiny T and many more. + A film matinee of BABYLON. Skabour classic Scooter Ride-Out. The poster shown is all hand lettered by Teflon in recognition of one of Jamaicas great graphic designers back in the 70s of Denzil “Sassafras” Naar, a legend in Dancehall and Reggae history. 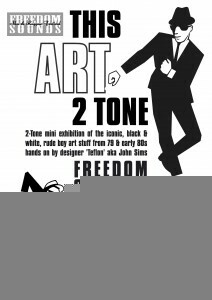 Teflon will be at the FREEDOM SOUNDS FESTIVAL 2018 April 20/21 with his exhibition showing of “This ART 2 Tone”. Plus also giving a Q&A at a showing of the icon film “Dance Craze” on Wednesday April 18th at the Rex Am Ring in Køln.